Cultivating a butterfly garden probably wasn’t a pastime for the Sisters. Even though the Brothers would have understood the value of bees, they wouldn’t have given much thought to the beauty of a garden dedicated to them. We modern folk, however, do appreciate the beauty of our native plants and see the need to create natural habitats to assure that butterflies and bees can indeed thrive. Lauren Nedrow, a Conestoga Valley senior and vice-president of Venture Crew 1861 (a co-ed branch of the Boy Scouts of America), is working to make sure that butterflies will find a natural habitat on the grounds of the Ephrata Cloister. Working in concert with Sue Fisher, her former teacher and a member of the ECA Board of Directors, Lauren created a plan, gathered materials, and assembled workers to complete the project. On Monday, April 22, she and local scouts in her Venture Crew 1861 of Gettysburg and Scouts BSA Troop 82 of Brownstown will begin to dig the site for the garden. The garden will be located in the grassy area between the parking lot and the Visitor Center, set back closer to the trees and the picnic area. Pictured is the planned location. Originally, they had planned to place the garden closer to the creek near the spring, but last summer’s heavy rains flooded the area frequently, making that site totally unsuitable for planting. Lauren is excited about this Venture Crew project, which will help her achieve Summit rank, the highest advancement in the program. “The butterfly garden I am building will provide a much-needed habitat for some endangered butterfly species, as well as providing an additional natural attraction to the Ephrata Cloister’s historical site,” she commented. On Saturday morning, April 27, the group will place brick edging around the garden plot, install a bench, and plant seeds. On May 11, other plants will be added to enhance the garden. Then they will water, wait, and watch for the butterflies to gather. Come and watch, too! What has been your involvement with Scouting? Lauren: I first joined a Girl Scout troop when I was in third grade and progressed through that program until eighth grade, earning both the Bronze and Silver Awards for community service activities. Around that time, I joined Venture Crew 1861, which is a co-ed branch of the Boy Scouts of America (BSA) organization. Since then, I have gone on many high-adventure trips including the 2017 National Scout Jamboree and a 100-mile canoe trip in the Allagash Wilderness Waterways this past summer. I currently serve as the Vice President of my Venture Crew, a position I have held since I was in 10th grade. This past year, I worked to co-found one of the first all-girls Scouts BSA Troops (Troop 82 of Brownstown), for which I have served as a Junior Assistant Scoutmaster since February of this year. What requirement does this project fulfill? Lauren: This service project is a requirement for my Summit rank, the highest advancement in the Venture Crew program. This rank and the community service project are very similar to that which is required of an Eagle Scout in the Scouts BSA program. Lauren: Besides this service project being a requirement for my advancement in the Venture Crew program, I am excited to work on this project to promote my local community’s environment. 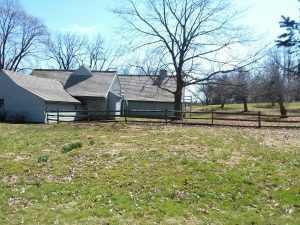 The butterfly garden I am building will provide a much needed habitat for some endangered butterfly species, as well as providing an additional natural attraction to the Ephrata Cloister’s historical site. Lauren: Through my planning for this project, I have learned a lot about gardening and endangered species as well as some important knowledge about how to create a healthier environment for my community. Lauren: As this is a Scout service project, I will have help from local scouts in my Crew (Venture Crew 1861 of Gettysburg) and Troop (Scouts BSA Troop 82 of Brownstown). Both groups have a strong community service focus, as the BSA organization encourages the development of environmentally-conscious youth. What excites you the most about it? Lauren: This project will provide to me the opportunities to impact my local community while also assisting in the improvement of the environment. I am excited to encourage other people to be environmentally conscious and active in improving their local communities. Lauren: The garden needs to be relatively self-sustaining with little maintenance, which will be the most challenging part of this project. The garden needs to be healthy and fairly long-lived in order to have the highest impact on the overall environment.